The Senate has been preparing to vote on the Better Care Reconciliation Act (BCRA), which would repeal significant portions of the Affordable Care Act (ACA or “Obamacare”) and replace them with alternative policies. However, when it became apparent BCRA might not have sufficient support among Republican senators, Senate Republican leaders began to consider a repeal of many ACA provisions without specific replacement policies (the Obamacare Repeal Reconciliation Act of 2017 or “Clean Repeal”). Senate leaders plan to bring the legislation up for a vote any day, although it is not clear which bill will be considered. It is possible that amendments may be offered for BCRA, or they might fall back on Clean Repeal, legislation that the Republican Congress passed in late 2015, but was vetoed by then-President Obama. Because CHADD does not know exactly which bill the Senate is planning to vote on, we don’t know exactly how to advise our members. However, we can report what BCRA looks like now and how it could affect individuals with ADHD. We can also report what the Clean Repeal bill provides and how it could affect individuals with ADHD. The Congressional Budget Office (CBO) has released official estimates about the version of BRCA posted on the website of the Senate Committee on the Budget on July 20, 2017. The CBO estimate shows that BCRA would reduce the deficit by $420 billion over ten years. CBO further estimates that BCRA will result in 15 million fewer people having health care coverage in 2018. By 2026, this number would increase to an additional 22 million Americans lacking insurance, compared to current law. BCRA makes a number of changes to Medicaid and private health insurance that would, on the whole, make it harder for many families to access ADHD treatment. Most notably, BCRA substantially cuts federal funding for Medicaid, which is a primary payer for millions of children with ADHD. Over time these cuts would lead to reduced benefits, decreased access to health care providers, and would make it harder for families to access ADHD treatment. It would also roll back the Medicaid expansion, which allows many adults to access ADHD treatment. In the individual marketplaces (what is often called "Obamacare"), most families would receive less assistance paying for their insurance premiums, and the insurance they pay for would offer less coverage. This too could substantially limit access to ADHD treatment for millions of families across America. BCRA could benefit some families. For example, it extends premium subsidies to individuals below the poverty line but who do not qualify for Medicaid and it allows families to obtain premium subsidies if a parent’s employer provides coverage only for the parent. Proponents of the legislation also tout its potential to reduce insurance premiums; however, these effects are still somewhat speculative. Decreases in premiums may be caused in part by insurance plans declining to offer certain benefits, including coverage for expensive prescription drugs, behavioral health services, and mental health care. Although Obamacare required plans to provide coverage for these “essential health benefits,” BCRA would make it easier for states to opt out of providing these mandated benefits. Recent amendments offer additional funding that may reduce premiums for some, but the effects on coverage are uncertain. Some of the other changes could also impact individuals with ADHD. BCRA mandates a six month "lock-out" period for re-enrolling in health insurance after a period of not being covered. However, the Senate Parliamentarian has ruled this provision violates to the so-called Byrd Rule, which means it could not be enacted without Democratic support (which is unlikely). Individuals with ADHD who obtain health insurance in the individual market would need to pay very close attention to deadlines to avoid coverage lapse. Similarly, BCRA limits the period for which Medicaid coverage can be retroactively applied when a Medicaid eligible individual seeks treatment before enrolling in Medicaid. BCRA is similar in many respects to the American Health Care Act (AHCA), passed by the House of Representatives in June, and different in other critical ways. Read CHADD's analysis of the AHCA. 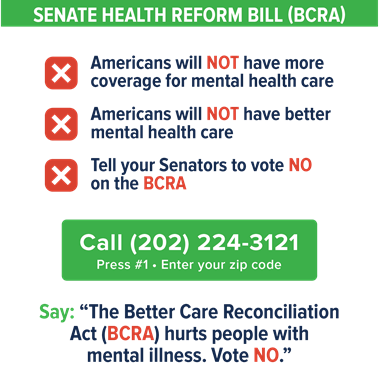 Read a side-by-side comparison between BCRA, the AHCA, and existing law - especially how it affects mental health and pre-existing conditions. CBO has also released official estimates about the Clean Repeal legislation posted on the website of the Senate Committee on the Budget on July 19, 2017. The CBO estimate shows that Clean Repeal would reduce the deficit by $473 billion over ten years. The CBO also estimates that Clean Repeal will result in 17 million fewer people having health care coverage in 2018. By 2026 this number would increase to about 32 million additional Americans without coverage, compared to current law. CBO further estimates that by 2020 about half of the U.S. population would live in areas with no insurer that offered insurance for individual policies purchased through the marketplace or directly from insurers; and that would increase to about three-quarters of the population by 2026. In addition, the CBO estimates the cost of average premiums for individual policies purchased in marketplaces or directly from insurers would increase about 25 percent more than projected under current law by 2018 and would double by 2026. Clean Repeal would repeal many provisions of the ACA or Obamacare but would retain many of its insurance rules. After Clean Repeal, all plans sold on the individual markets, as well as Medicaid plans, would still be required to cover essential health benefits (EHBs), which include treatments for mental health, behavioral health and substance use disorders. Health insurers would still not be permitted to deny health insurance coverage or charge higher premiums based on having a “preexisting condition,” like ADHD diagnosed before an individual buys health insurance. These protections would continue to help individuals with ADHD. However, the legislation would immediately repeal the penalties for individuals who do not maintain qualifying health insurance coverage (including coverage under government programs like Medicaid) and for employers with 50 or more full-time employees who do not provide qualifying health insurance to their employees. CBO estimates that elimination of these penalties would cause premium costs in the individual marketplace to rise for individuals, such as those with preexisting conditions who needed to retain coverage, and could cause employers to stop offering group plans for employees. These results could make it much more difficult for families and individuals with ADHD to obtain insurance coverage. Starting in 2020, the legislation will repeal Medicaid expansion which has allowed many adults in some states to access ADHD treatment; and premium subsidies that help individuals purchase insurance in a marketplace will also be repealed. This could significantly limit access to ADHD treatment for millions of families nationwide. 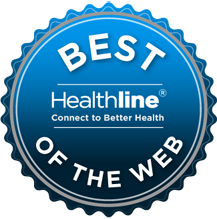 CHADD is dedicated to protecting access to ADHD treatment for families across America. While our members may have different views on the repeal and replacement of Obamacare, CHADD has serious concerns that these bills, if either were enacted, would create significant hardships for many children and adults with ADHD. For these reasons, CHADD has been on the record with Congress and joined organizational sign-on letters in opposition to the legislation. While CHADD encourages its members to do their own research on the current proposals, we are disseminating the action alert below for those who are interested in making their voices heard in the legislative process. 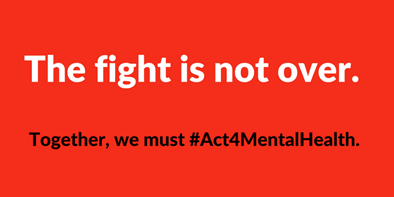 The action alert was prepared by the Mental Health Liaison Group (MHLG), a coalition of which CHADD is a member. The Senate is expected to vote on one of these measures this week, and as early as Tuesday. Yesterday, Senate leadership released a revised version of the Better Care Reconciliation Act (BCRA). Unfortunately, the changes do not make the bill better. Subject line: This bill hurts. Text: The Senate delayed a vote on the Better Care Reconciliation Act (BCRA), but they are back at it—and they are moving fast. A vote could happen any day.